Dr Mahipal Sachdev wants to build presence of Centre for Sight across India by 2020. Today, it has 49 centres across north, central and west India. 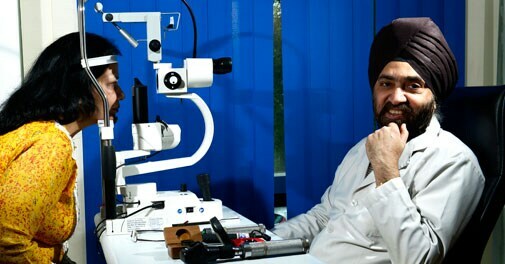 More than two decades after joining Delhi-based All India Institute of Medical Sciences (AIIMS) - first as a MBBS student and later a faculty member - when Mahipal Sachdev, Chairman of Centre for Sight, decided to start his own practice, he faced a lot of resistance from his family. But he decided to take a chance. His only buffer was support from Apollo Hospitals promoter Prathap Reddy, whom he knew from the past. Sachdev rented a room in a local clinic where he would treat patients for about four hours and spend his remaining working hours in Delhi's Apollo Hospital. In a short period, Sachdev made a name for himself. Later, he moved to a bigger centre nearby. "When I quit AIIMS, my intent was to create a tertiary eye care centre. Buying land was the biggest impediment. Coming from a middle-class background, I didn't have access to large funds," he says. Mahipal's wife Alka Sachdev, who is now the CEO of Centre for Sight, decided to continue her government job for sustenance. "We decided we will not take loan from family because if we fail, we will not have to answer anyone. We took a small loan by pulling a few strings. In the first few years, whatever was earned was ploughed back into the business," she says. With his initial success, Mahipal was able to attract talent from AIIMS and gave them higher salaries. Business grew at a modest pace until 2009 but then picked up momentum. Mahipal Sachdev, 56, says business grew at an annual pace of about 40 per cent in the past five years. Today, it has 49 centres across north, central and west India. Broadly, the hospital chain follows three models of expansion - greenfield, brownfield and running ophthalmology departments in hospitals. It does not follow a franchisee model so that the administrative control remains in their hands. Each model has its own advantages and disadvantages. In brownfield projects, for instance, where they acquire practice of other ophthalmologists, the break even comes fast because the acquired centre already has a running operation. "There is no suspense. However, the risk of losing the key people is always there," she says. By 2020, Sachdev says, that he wants to build presence across India. "We have a target of opening up 10 new centres this year which will take our revenues to over Rs 175 crore in 2014/15, up from Rs 133 crore in 2013/14," he adds. Setting up a centre costs anywhere between Rs 2 crore and Rs 15 crore depending upon the equipment and services it plans to offer. Centre for Sight does not buy properties, it takes them on lease. Growth in older centres is around 15 per cent while new ones, after a year of launch, grow at around 40-50 per cent. What are the future prospects? Sachdev points out that every third blind person in the world is Indian, according to some estimates. "The commonest cause of blindness is cataract. There are around 12 million blinds in India out of which 8 million are blind because of cataract. With life expectancy increasing, diseases such as cataract will grow." Centre for Sight has raised private equity fund twice - both time from Matrix Partners-in the past to fund its expansion. In the next few months, Sachdev plans to raise more money from private equity. Parijat Ghosh, India health-care practice head at Bain & Company, says that single-specialty format in the health-care sector is gaining momentum but there are some challenges that could hinder their growth plans. "People in India give more emphasis to doctors rather than a hospital brand name. So acquisition of key doctors in each locality is crucial. Secondly, how do you ensure consistent level of quality and care on a broader level," says Ghosh. Sachdev agrees by saying that getting the same standard operating procedures and maintaining clinical excellence could pose challenge. "All doctors are not same," he says.